Delegates from around the world attended the International Conference on CADCAM, Robotics and Factories of the Future at Middlesex in July. Middlesex University hosted the 27th International Conference on CADCAM, Robotics and Factories of the Future (CARS & FoF) in July 2014. It was the second time CARS & FoF has come to Middlesex, with delegates from 25 different institutions across 14 countries and five continents attending the three-day event. Held at the Hendon campus between 22 and 24 July 2014, the conference was organised by Middlesex in collaboration with the International Society for Productivity Enhancement, who founded CARS & FoF 30 years ago. The conference aims to provide a united platform for policy makers, researchers, academics, engineers and users of CAD/CAM, robotics and automation, and advanced manufacturing technologies – and it certainly succeeded. A diverse range of high-quality paper presentations were made to delegates, with all proceedings published in Materials Science and Engineering, Volume 65 on the IOP Conference Series website by the time the opening session began. Mehmet Karamanoglu, Head of Design Engineering and Mathematics at Middlesex, said: "The quality of the speakers has been really fantastic this year. "It has provided a great opportunity for delegates to not only learn about the exciting work that our colleagues around the world are doing but also to meet and network with one another." CARS & FoF 2014 was sponsored by Festo AG, National Instruments, Semta, WorldSkills UK and AllConferences.com, with Festo taking a particularly prominent role. The German company specialises in production and process automation, providing automated plans to move objects on production lines for the likes of Jaguar Land Rover, Ford and Nissan. Festo's didactic arm also runs a wide range of classes and lectures, contributing significantly to engineering education by providing learning systems that are used to simulate production lines for students to work with at universities like Middlesex. A selection of these live systems were exhibited at the conference, while Dr Nina Gaissert, from Festo's Corporate Bionic Research arm, was also a keynote speaker and stunned the audience as she explained how Festo uses nature to inspire production processes of the future. 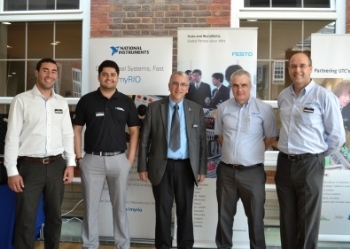 "Festo was last involved with CARS & FoF when it was last at Middlesex, but the theme of this year's conference is very close to our hearts as it revolves around robotics and factories of the future, which is most of what we do," said Babak Jahanbani, Didactic Manager at Festos's UK Learning Systems department. "The quality of the conference has been very good, I was very impressed with the quality of the papers and the discussions and exchanges we've had with delegates was promising." National Instruments (NI) provides Middlesex with technologies that enable students to "do engineering" through project-based learning and also took a leading role at CARS & FoF 2014. Showcasing a range of unified technologies that bridge the cyber and physical worlds, the NI conference exhibition demonstrated a platform for advanced control design, modelling and simulation, machine vision, intelligent embedded systems and wireless sensor networks. The NI team also hosted a hands-on workshop, allowing attendees to experiment with closed-loop control algorithms to solve the classic inverted pendulum control problem. "NI was proud to partner CARS & FoF 2014, a truly international conference that blurred the lines between academia and industry, highlighting future trends for advanced manufacturing," said Richard Roberts, Academic Technical Marketing Engineer at the organisation.